‘So proud of my client Ammar who invested in the 3 month transformation package. Listen to his thoughts on what he has achieved and how far he has come. If this sounds like you don’t wait until you turn 50 contact me and learn how to look move and feel great – you have nothing to lose and everything to gain’. Do you know that you should be exercising but not sure what to do or how to start? Then working out on-line in the comfort of your own home could be the answer. 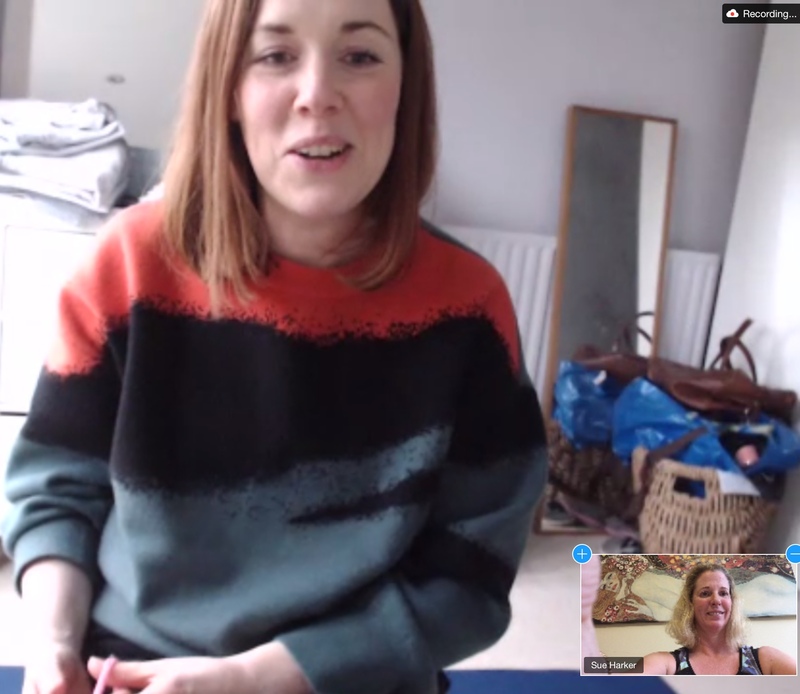 Listen to what my client Annie has to say about working with me virtually on Zoom to get herself out of back pain and banish neck spasms, all from the privacy of her own home. Resulting in new found confidence to live the life she loves. Remember- Movement is for life! 1. What was your situation like before we started to work together? 2. What reservations did you have about working with me before you started exercising? 3. What has the process of working with me being like? 4. What is the one best result you have got from Working with me? 5. If there is anyone that might be listening who is on the fence about investing in on line training what would you say to them? I have always been relatively energetic but not done any targeted exercise. Susan’s pilates mat class works is hard and it is worth it as I have learnt what exercises work and how. I aim to continue to improve at a steady pace. I saw Susan mainly to become fitter and increase my stamina and lose weight. I have a busy and demanding job and enjoy spending time with my family. So I think of going to the gym and exercising as essential to my well being and balance to my life. I have improved my fitness by completing the three peaks challenge and lost 9 kg during the time I have been with Susan. She is attentive and focussed and good fun to be with at 7 am in the morning! I saw Susan as I had mechanical lower back pain that I had suffered with for 30 years. It was a shock to the system to do exercises but I did graduate from corrective exercises at home to using the gym under Susan’s guidance I now go to the gym 6 times a week and I top up once a month with Susan to maintain my perfect technique and posture and avoid bad habits from creeping in. I have no back pain, blood pressure and cholesterol have all decreased. Susan communicates well and has the kind of disposition that makes exercise almost pleasurable! It was not a great situation before I started with Susan as I have not been well. It has been a tough process working with Susan but the one best result is a stronger core. The classes are demanding but Susan is very caring of individuals and good at showing people the exercises. The only time I hurt myself is impact injuries! Skiing has gone amazingly, no injuries to date unless on impact – which don’t happen too frequently! I have got you to thank for my body being properly robust, for which I will be eternally grateful. I have managed to put on a good amount of muscle mass and am properly charging race courses these days. I incorporate what you taught me into every gym routine I do. Before I started with Sue, I had surgery on my shoulder and was in pain for a number of years. I was not confident with my upper body strength. I was uncertain about working with Sue, but the process of working with her has been good as we have gradually built up to more difficult exercises, to build my strength and confidence slowly. It is amazing what I am able to do without pain at the end of the lessons vs when we started. The one best result is getting the right head and neck position, which has significantly reduced the strain on my neck and shoulders when doing certain exercises. This has allowed me to strengthen my core but maintain a relaxed neck position and reduce the pain in my shoulder. Overall I feel stronger, with less tension in the upper body. I found Sue because I was having such hip pain it was almost unbearable. I sprained my knee badly and the knee sprain threw my gait, such as it was with the sprain, off so badly I started having hip pain. I knew the sprain would heal in time but was not sure the hip would recover because the sprain took months to truly heal. I felt strongly that physical therapy or exercise regimes dedicated to musculoskeletal problems could resolve the hip pain. I am astonished at the difference my sessions have made. Keeping in mind that I just turned 71, I have vastly more strength, more endurance, more energy and no hip pain. When we started, I had to sleep for several hours after a session. Now I just lay down for a bit and read. This is wonderful – less time spent sleeping during the day. I sleep better now at night as well. I just could not be more pleased! If I had to narrow my experience down to the one best result, it would have to be the absence of pain. Not only the absence of hip pain but the Pilates also addressed the sprained knee and it healed very quickly because of the increased movement and blood flow and there is no residual anything. For anyone who might be reading this and debating whether online lessons through Zoom or Skype can actually work, I would emphasize that my experience online is far superior to my experience in a studio. Sue is an amazing and knowledgeable instructor. I had had a back and shoulder injury and had not done the necessary work to return to fitness. I had no reservations about going to see Sue for help: she devised a broad programme to address all areas of the body, while being watchful of the previously injured areas. It is early days yet to identify differences, but already I do feel a definite improvement in muscle strength and balance. I would certainly refer Sue: she is knowledgeable and able to manage all levels of fitness and strength. I started pilates two years ago and my posture and general wellbeing improved. I was concerned with sue as a new teacher. I found sue to be very strict and particular in the exercise movements I did. But the nature of the improvement and the demanding high standards ultimately paid off. The one best result is less back ache and tension in the shoulders through even better postural alignment. I feel taller and younger! The best result from working with Susan is an understanding and awareness of my bodies weaknesses and how to manage them. ( I have lower back pain, painful knees and sore hip). I keep coming back for more as I keep improving so it is quite addictive! I resolved any reservations as I worked steadily with a great trainer who is knowledgeable and caring. I wanted to make sure that the teacher I had would help me to understand what was needed for my body and its special needs. Before seeing sue, I thought I was quite good, actually better than I turned out to be! The process of working with Susan. Has been a steep learning curve, but exhilarating , challenging and enjoyable. The one best result is that, through isolating parts of the body, I have learned an awareness of which muscles to use and with greater precision. She may be tough, but she is very observant, and she knows all the quirks that the body will try and get away with. She is a passionate, determined and enthusiastic teacher, and I know that continued work with Susan will strengthen all parts of my body and improve my balance. I suffer from mechanical lower back pain. I really want a stronger less painful back. The free session helped me to identify and have a better understanding of the parts Of the body that should be working. I was given exercises to identify and get my core working. I have invested in the recovery package and I look forward to pain-free, fun playing with my children under the age of 5. Before I started working with Susan I was postnatal 8 months with lower back stiffness. I had no reservations about working with Susan. The process has been straightforward and focussed and as a result no more back pain. The one best result is that I have reprogrammed myself to exercise. I felt so far behind and that I would never feel fit again, but now I am back in the game! “I thought I was in decent shape even though I have had chronic lower back pain for the last 3-4 years. Well I WAS WRONG. With Sue’s expert help after 6 weeks my back no longer bothers me. It turns out my core was very out of shape. I thought of working out as going to the gym and lifting weights and Pilates as something dancers did. It turns out I really like it. It is very challenging I think the core work included with the balance and stretching required is an important key to being active late in life. Sue’s knowledge is excellent. I hurt my back on the day before our 3rd. session so I thought I would not have to work out, well she would have none of that. She very carefully and thoughtfully had me moving and stretching by the end of session it had loosened up considerably. After doing the same stretches and exercises she showed me the following week I was back to 95% and able to do the regular workout with her cautioning and questioning me through the whole thing. Sue has a way of explaining things to make you understand the how and why of all the movements and how to apply it to your daily life. She also watches your progression and builds upon it adding new things every week to keep you learning and growing stronger. It is unique to me how it builds on itself and all the movements are related. NO MORE BACK PAIN! I can feel the difference every day, I have more energy, flexibility and my clothes even fit better. Throughout the Zoom sessions, Sue is watching your every move to make sure you are doing it correctly for the most benefit of the muscle group and to make sure you are not straining something you are not supposed to. I also recommend the videos she makes in the sessions, when you watch them you can see the corrections she is talking about which helps you understand and learn the correct movements. I don’t know of any studios that do this”.